the horn of my salvation, and my refuge: you are worthy of praise. In this psalm, David writes of the deliverance he has received from the Lord. He speaks vividly of the challenge of his enemies, the attacks he endured, yet through it all, the Lord was his Savior. When we are facing challenges and difficulties in life, don’t we wish it would be the same for us? 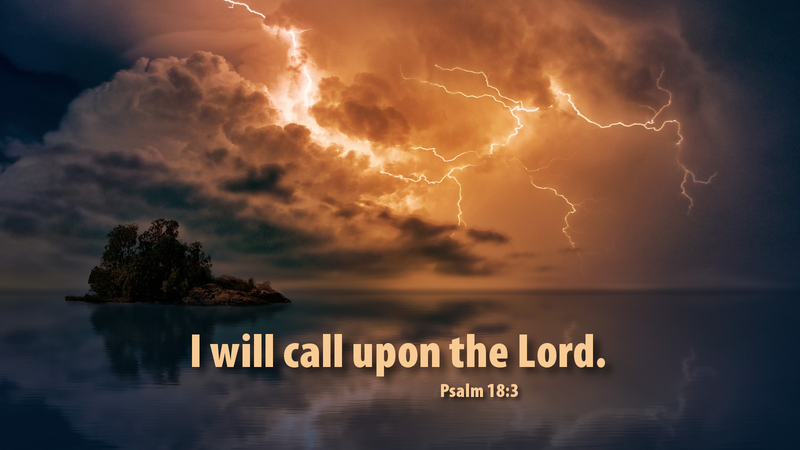 We call out to the Lord who hears our cries, parts the heavens and comes down to help us with a storm cloud under his feet! As David was an earthly king, he expressed his deliverance in militaristic terms, with the Lord God attacking David’s enemies with hailstones, arrows, thunderbolts and victory! God delivers us in a different way, as he comes to us, not with smoke from his nostrils and fire from his mouth, but as a baby, conceived of his Holy Spirit, born of the Virgin Mary. God comes to help us as the Word made flesh, the Word which is sharper than a two-edged sword, the Word which will not return to God empty! Prayer: I love you, O Lord, my strength, my stronghold, in whom I put my trust. Amen. Advent Action: Do you know someone who is struggling? Share this psalm with them, to give them courage and assurance.